by Jessie Wise and Sara Buffington. A plain-English guide to teaching phonics. Every parent can teach reading; no experts need apply! 231 lessons; 369 pages. at what lesson should we start introducing starter reading books? My daughter has developed a great love for reading and wonderful confidence. Thank you for this guide! 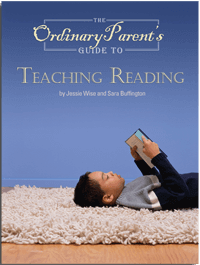 Do you recommend continuing a reading program following the completion of Ordinary Parent’s Guide to Teaching Reading? I am using the First Language series in our homeschool, too. No, we don’t recommend any formal reading programs after a student has completed O.P.G. Once a student can decipher words, she needs lots of practice; so we just recommend LOTS of reading…books from the library, bookstore, home, etc. Aside from everyone learni g at there own pace. Is there a general rough estimate it should be broken down? What lessons should be taught in first grade. We did 1-40 for Kindergarten, as of Feb, but will continue till May learning more. Whatdo you suggest? It sounds like you’re off to a great start! For the rest of this schoolyear, you could stay where you are in the book, reinforcing the concepts with lots of reading every week…or you could push on to Lesson 53. Then in 1st grade you could aim to complete Lessons 54-105 or 54-133, depending on the child’s speed.